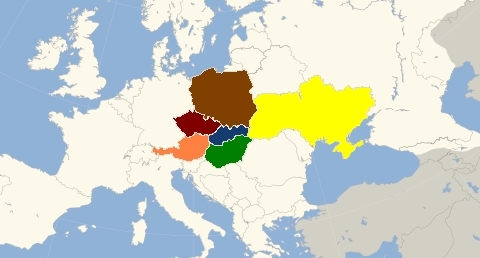 The neighbouring countries of Slovakia (blue on the map below) are: Czech Republic (west, red), Austria (south-west, orange), Hungary (south, green), Ukraine (east, yellow), Poland (north, brown). Relations between the Slovak Republic and its neighbours can be divided into bilateral and multilateral. Along with Slovakia, four of the neighbouring countries (Czech Republic, Poland, Austria, Hungary) are members of European Union and in the Shengen Area. That means people and goods can freely cross the borders without passport control. The passport or visa are needed only for crossing the borders with Ukraine. Slovakia belongs to the community of four states of the Central Europe, called Visegrad Group (V4). Members of V4 are Slovakia, Czech Republic, Hungary and Poland. Goal of the Visegrad Group is the propagation of common interests in the process of European integration and transition of these economies. Slovakia borders (252 km) with the Czech Republic are on the west side of the country. Despite the fact that Slovakia’s culture, population and language are very similar to the Czech, the history of Slovakia before WWI does not match with the history of Czech Republic. After the World War I. two nations created a united state Czechoslovakia which through various obstacles held out until 1992, when it peacefully split. Since 1st of January 1993 there were two fully independent countries, the Czech Republic and Slovakia. Bilateral relations between Slovakia and the Czech Republic are usually known as very good and even brotherly. There is a large number of mixed families. Up to 320 thousand Slovaks study or work in the Czech Republic (mostly in Prague), there is practically no language barrier. Thanks to the common past the two countries have strong cultural and economic relationship. For cars – Kúty-Břeclav, Brodské-Lanžhot, Holíč-Hodonín, Skalica-Sudoměřice, Vrbové-Veľká nad Veličkou, Myjava-Veľká nad Veličkou, Moravské Lieskové-Strání, Drietomá-Starý Hrozenkov, Horné Srnie-Bylnice, Lysá pod Makytou-Střelná, Makov-Horní Bečva, Makov-Veľké Karlovice, Svrčinovec-Mosty u Jablunkova, Nová Bošáca-Březová, Klokočov (Turzovka)-Bílá, Podzávoz–Šance. For trains – Čadca-Mosty u Jablunkova, Lúky pod Makytou-Horní Lideč, Kúty-Lanžhot, Nemšová-Vlársky prusmyk, Skalica-Sudoměřice, Holíč-Hodonín, Myjava-Veľká nad Veličkou, Lúky-Horná Lideč. Although the Slovak-Austrian cross-border is only 91 km long, Austria-Slovakia relations have a rich history. Both nations have lived for decades in the common Empire, share close moral and Christian values, traditions, culture and view of the world. Common values define not only the past, but put a good basis for current cooperation, mostly in the program of higher education, science and research. Austria was the only EU Member State neighboring with Slovakia and in 1996 was the largest foreign investor in Slovakia, at the same time strongly supported the inclusion of the Slovak Republic into the EU. In the meantime, the total import in the Slovak Republic figures Austria on the 4th place and the export from the Slovak Republic to Austria is also placed on the 4th place. For cars – Bratislava-Berg, Jarovce-Kittsee, Moravský Svätý Ján-Hohenau. The border with Hungary is 677 km long. From the outset of Slovakia’s establishment, both of the countries try to have a good relationship. Hungary is one of the most important target countries, total export from Slovakia to Hungary is 7.2%. Common membership in NATO, EU as well as in the Visegrad Group is an important framework of cooperation for the development, common interests and values. Large Hungarian minority (9.5%) is living next to the Slovak/Hungarian border. In Komárno (south Slovak city, right on the borders), there is even a university where they teach and study in Hungarian language – University J. Selyeho. For cars – Bratislava-Rajka, Hraničná pri Hornáde-Hidasnémeti, Komárno-Komárom, Kráľ-Bánréve, Slovenské Ďarmoty-Balassagyarmat, Slovenské Nové Mesto-Sátoraljaújhely, Šahy-Parassapuszta, Šiatorské Bukovinka-Somkoújfalu, Dlhá Ves (Domica-Aggtelek), Hosťovce-Tornanádaska, Milhosť-Tornyosnémeti, Veľký Kamenec-Pácin, Medveďov-Vámosszabadi, Salka-Letkés. For trains – Rusovce-Rajka, Komárno-Komárom, Fiľakovo-Somoskoújfalu. Ukraine is the only Eastern European country with which Slovakia has a common border. The border is 97 km long. At present, Ukrainians welcome any initiative of Slovakia to share the experience of the accession process to the EU. The basic document for the implementation of Ukraine’s integrating ambitions is the Action Plan, European Union – Ukraine. The Slovak Republic is a supporter of the integration of Ukraine into Euro-Atlantic structures. For example, Slovakia helps Ukraine with liquidation of old ammunition. For cars – Vyšné Nemecké-Užgorod, Ubľa-Malyj Bereznyj. For trains – Čierna nad Tisou-Čop. The great advantage of the Slovak-Polish relations is their good relationship in the past. As with other V4 countries, Slovakia and Poland share the same interests in and outside the European Union. Poland and Slovakia have a very similar economic and security systems. Mutual trade is 25% and it is rising. Poland is ranked in the top five trading partners of Slovakia. The Polish border with Slovakia is 444 km long. For cars – Vyšný Komárnik-Barwinek, Javorina-Lysá Polana, Trstená-Chyžné, Becherov-Konieczna, Lysá nad Dunajcom-Niedzica, Suchá Hora-Chocholow, Oravská Polhora-Korbielow, Skalité-Zwardoň, Podspády–Jurgow. For trains – Plaveč-Muszyna, Skalité-Zwardoň. I’m trying to find an overview of the current border crossings between the Slovak Republic and Hungary. Any idea where I can find these? Thanks? Hi Kris, thank you for your great question. In fact, as both countries are in Shengen territory, you can cross the border wherever you want without passport control, unless it is a protected area above the second level of nature protection. At places under higher levels of nature protection (national parks and protected landscape areas) it is mandatory to respect the law of nature protection and visitors’ codes, i.e. the visitors can freely move only on marked paths or cycling routes. We added the information about the road and train crossings on this page, please see above. Hi,my name is ibrahim and akenyan citizen.Iam really interested to live in slovakia and i use to love it since childhood,how will this be possible? Do you have duo citizenship in your constitusion?your responses will be highly appreciated. for the visa issues please see http://www.slovak-republic.org/visa-embassies/. Yes, Slovakia allowes the citizens to have dual citizenship. Hello, We are going for holidays to Krakow Poland, by car, and we want to cross to Bardejov, please tell us the best pass to cross. Tnak You. Sorry, I don’t have any experiences with that route, but you can use this (Get directions link): http://maps.google.com/ Looks like Muszynka is the best. I was under the impression that dual citizenship has been revoked. A Slovakian citizen cannot be a citizen of another country or they will lose their citizenship. Yes, unfortunately, it is still correct.